It’s been a while. In fact, this is the longest I’ve gone without publishing a blog post in about two and a half years. In the past few weeks, life got busier and I needed to press pause. Every week, my regularly scheduled blog alarm would buzz, but I couldn’t find the time to put my ideas down on paper--that’s something I want to work on in the school year ahead. Right now, my time has been dedicated to a new challenge at a new job. I’ve also been hard at work on a revamped blog with a new title and more focused content. Then there’s the countless hours of doctoral work this summer and my almost ready draft of chapter two of my dissertation. All of that is great; I’m working hard, and I’m happy. As my professional worlds continue to grow and evolve, I needed to press pause to regroup, reclaim some balance, and make sure to enjoy my life in and out of schools. All educators know that we need to give so much to our students and schools to do our jobs well; sometimes we need a refresher so we’re not running on empty. And now, with the relative comforts of a teacher’s summer over, I’m eager for my new challenges as a leader, leader, and writer. This will likely be the last post for the next few weeks as I continue to make serving my new school my focus and learn to better balance these complex worlds. But look forward to a brand new blog coming soon--September 30 is my personal deadline. I’m looking forward to a new site, improved look, and more focused content (read more about it below!). I hope you will join me on the journey. Assistant Principal Schoenbart. I like the sound of that. I couldn’t be more excited to have joined the Darien Public Schools as one of the Assistant Principals at Darien High School. I loved my time as a classroom teacher and a coach--and already miss my Ossining colleagues and students--but it was time for a change and the next challenge. In my years in the classroom, I experienced tremendous growth as a teacher, thinker, leader, and person, and I couldn’t be more proud of that time. And I'm even more proud of the work with students and colleagues that I know will continue. And now, I’m ready for the future. In just over a week in my new position, I’ve jumped right in the deep end, every day learning and taking on new challenges. I will be responsible for a third of the students as “their AP,” supervise teachers, and help manage the building needs. I’m also thrilled to have a large role in technology and innovation as we roll out the start of a 1:1 iPad program. Wherever this year and new role takes me, Assistant Principal Schoenbart is ready to lead, learn, and serve. The title for this blog came from an obvious play on my name, but in creating it, I ignored the obvious choice: #SchoenTell. My students created the #SchoenTell hashtag for our English classes, and for two years I used it throughout my work with students. I liked the separation--that hashtag belonged to the work in my classroom. But now, with a change in my role, comes a change in purpose. I’ve been working hard on an upgrade to this blog, including a new site on a self-hosted WordPress, a more responsive layout, and updated content, when the realization hit me. Why not bring the #SchoenTell title with me? My work will always involve students, but I like the idea of retiring #SchoenTell from the classroom and bringing it more prominently into my professional world. It’s just too good not to. I also love the history of it: search it and you find the evolution of my growth as an educator, too. In the upcoming revamp, The SchoenBlog will become #SchoenTell. 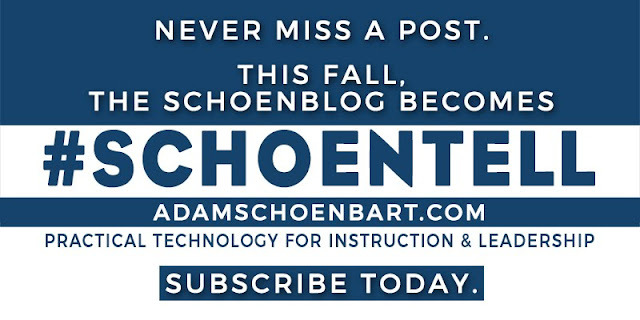 The web address will stay the same (in fact, both aschoenbart.com and adamschoenbart.com will take you here). The content might not focus on my own teaching as much, but will still be all about the worlds of technology, education, and leadership. Besides the job hunt, I focused a lot of time on my doctoral work this summer, reading thousands of pages of research and dissertations, refocusing my questions and investigation, and writing quite a bit. In the end, I worked out a revised prospectus, a start of chapter one, and an almost readable draft of chapter two. I had hoped to submit a literature draft by now, but it’s just not there. What I have happily accomplished is that I’ve refined my thinking, selected a concrete and interesting topic, and reframed my entire proposal. I’ve also taken some hundreds of pages of notes from thousands of pages of reading and synthesized them into an almost written thirty-something page literature review. Coming soon. My work is focused on the changing role of the school principal as a technology leader. Specifically, I’m investigating the relationship between principal self-efficacy and technology leadership. Do principals who are technology leaders have a stronger belief in their ability to perform their job of principals better? How do principals perceive their roles as technology leaders? Do school leaders need to be technology leaders in today's schools? It’s shocking how little actual research exists about technology leadership; everyone just agrees that we need more of it. I also love the connection between technology leadership, leadership, and self-perceptions. How do we perceive the impact of technology leadership? Also, what does technology leadership even mean? You might be surprised at how many are unsure, and how many more are measuring it through outdated measurements of the dial-up age. We can do better, and I plan to continue to research, read, and write, both here and in my doctoral work. While I write for many reasons, I always come back to reflection. I write to think, reflect, and to grow. Sharing my successes, challenges, and questions with an authentic audience helps me to evolve as an educator and reflective practitioner, and it also keeps me honest. I’m writing this for me, but also for you. Learn with me. Ask questions. Pose problems. And every once in awhile, ask how the new job is going. Or even better, ask to see my chapter two draft. Thank you for reading, and I’ll see you on #SchoenTell in the next few weeks. Share your new start for this school year. How did you grow or change this summer? What are you excited about in the year ahead? Please share your thoughts in the comments or on Twitter @MrSchoenbart.